Hypoglycemia, or low blood sugar, is more likely to occur in cats with feline diabetes. By recognizing the symptoms of hypoglycemia in cats, pet owners can take steps to treat the condition and hopefully prevent it from occurring again. More than one member of the family may have given the cat its insulin injection. The wrong insulin dosage is given. Your cat may not have eaten its food, eaten less than usual, or may have vomited up its food. Your cat may be playing or been more active than usual. In mild cases, your cat may seem lethargic, weak or tired. Twitching or shivering can occur too. In moderate cases, your cat may act "drunk", ie. uncoordinated and disoriented. You might notice her bumping into things or acting different (aggressive, yowling, walking in circles, walking with her head tilted). In severe cases, your cat may suffer a seizure and/or become unconscious. Hypoglycemia can be very serious and lead to death (if untreated), so quick treatment is necessary. If you believe your cat is in a hypoglycemic state, you will need to raise its blood sugar immediately. Offer food. Give your cat a portion of tasty food and encourage her to eat. A freshly opened can of wet food often works well. If your cat doesn't want to eat, rub Karo or corn syrup over her gums. This is only a short-term measure. Continue to offer food and encouragement. You can mix syrup in with her food if she'll accept it. Approximately one tablespoon of syrup is enough for most cats. If your cat is showing symptoms of severe hypoglycemia, rub a small amount of corn syrup on her gums and cheeks and take her to the vet immediately. Make sure you don't put a lot of liquid in her mouth as she may choke. Monitor your cat after she eats (or after you give her syrup) to make sure the signs of hypoglycemia go away. Call your vet for advice if your cat hasn't shown signs of improvement within 30 minutes, or if she's getting worse. Note: when giving your cat syrup (or food), don't attempt to force it down her throat. Aside from being unpleasant to the cat, it's a choking hazard - and you could get bitten. Remember that a hypoglycemic cat doesn't feel like herself, and biting could easily occur. Just lift your cat's lip / cheek and rub the syrup on her lips and gums. Consult with your veterinarian to determine the next course of action. Your vet might recommend skipping the next insulin dose (to allow your cat's blood sugar to return to normal levels), or they may decide to alter the dosage. Do not stop administering insulin to your cat without first consulting with your vet. Even after the symptoms of hypoglycemia have resolved, you should still talk to your vet. Your vet may choose to run extra tests to make sure that there are no other issues, and try to identify the underlying cause of the hypoglycemic episode. 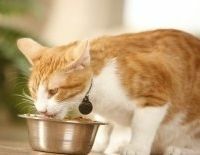 Feed your cat frequent, small meals and encourage him or her to eat. Monitor how much and when your cat eats. If you notice that her appetite has decreased, tell the vet. Administer the insulin as prescribed by the vet. Ask your vet for food recommendations. Note the activity level of your cat, and any changes in activity level. The amount of exercise your kitty gets will impact how much insulin it should receive. Keep a supply of syrup on hand for emergencies, stashed in an easily accessible location. You can fill syringes (without needles) with the syrup for a quick and handy way to administer it to your cat in case of a hypoglycemia episode. Post a note in a prominent place to let everyone know where this emergency supply is kept. Ask your vet if they can provide you with glucose packets that are safe for cats. If you board your cat or leave it with a pet-sitter, give them a supply of syrup or glucose along with a list of hypoglycemia symptoms and instructions on what to do. Also leave the phone number for yourself and for your veterinarian. Use a chart to track insulin injections. Ask everyone to check the chart prior to dosing the cat, and ask everyone to initial the chart when they're done. This can help to avoid "double doses" of insulin. Be alert for signs of hypoglycemia in cats. If it happens again, talk to your vet - your pet's insulin dosage may need to be changed.